A simple dipole antenna can be used for improved FM broadcast signals. A dipole is basically a length of conductor (wire) split into two portions and signal is taken off at the split. It has a nominal 3 dB gain over an isotropic source and is directional, tending to favor signals broadside to the wire. The dipole is customarily an electrical half wavelength of wire at the frequency of interest, since the impedance under this condition is theoretically 72 ohms resistive and is a good match to a 50-75 ohm source or load generally presented by interfacing equipment such as receivers and transmitters designed to work into this range of impedances. Enter the desired frequency and select the desired calculation from the drop box. Click on Calculate and the optimum length for that combination will be displayed in feet and inches. Lengths are given in feet, inches and fractions of inches, and in meters. The Quickie version to the below uses the common "T" adapter from the old coax cable PC networks, which can be found almost anywhere. 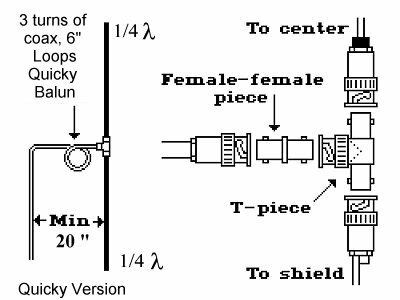 This approach has no tuning function, however, so the Free Radio Berkeley Balun is suggested - 1 to 3 turns of coax at about a 6" diameter. The turns can be larger or smaller than 6" - experiment for best results. 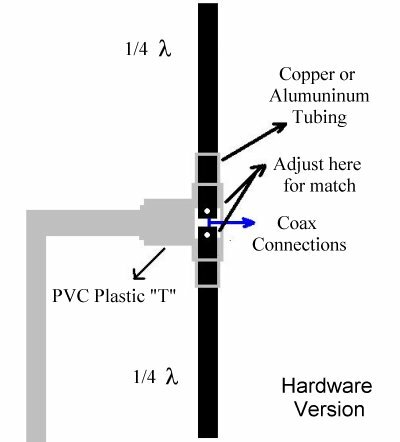 The hardware version can be tuned by slightly increasing or decreasing the distance between the ends of the two pipe sections in the center of the dipole.